The Russian armed forces plan to build their own cathedral in Moscow in record time, and are seeking donations. Defence Minister Sergei Shoigu says the project has Orthodox Church and state backing, but will be funded exclusively by the generosity of the Russian public, the official Tass news agency reports. Apart from many expressions of support for the project and the armed forces in general, social media has also seen debate about the unusual look of the cathedral. Some liken it to an armoured personal carrier, missile launcher, or air-defence battery, and the video on the cathedral website has drawn comparisons with the "epic poetry" style of the celebrated opening sequence to HBO's Game of Thrones TV series. 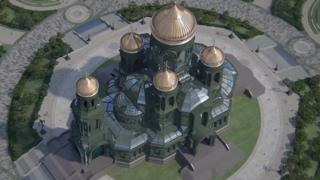 The Cathedral of the Resurrection will be built at the military-themed Patriot Park in the capital, and will also house a museum and virtual-reality display of historic battles - with the aim of "symbolising the spiritual values of the Russian army, which wields the sword only to protect the Motherland", the cathedral project website says. The website - which has a section for public donations - shows plans for a monumental building painted army green, and capped with traditional onion-shaped domes dedicated to the patron saints of all the branches of the armed forces. Reaching a height of 95 metres, this will be one of the tallest Orthodox cathedrals in the world, and the fourth-highest in Russia. It will cover 10,950 square metres (117,865 sq ft) in total, with room inside for 6,000 worshippers. The cathedral will sit in extensive grounds decorated with statues of various Christian luminaries with military connections, ranging from the Prophet Elijah to the medieval Prince Alexander Nevsky, who is venerated as a saint in Russia. General Shoigu wants it completed in time for the 75th anniversary of the end of World War Two in 2020, and has urged senior officers to get involved in the donations drive - "on a voluntary basis, of course", according to Vedomosti newspaper. The defence ministry's Zvezda TV has been quick to report the high-profile pro-Kremlin public figures who have donated already, led by Nikita Mikhalkov - the director of the Oscar-winning film Burnt by the Sun. He handed over half a million roubles (£5,545; $7,166), and told Zvezda that the cathedral will be a "powerful force to unite the Russian people, and set an example to the whole Orthodox world". He urged the public to give generously "without waiting for thanks". Another backer is President Vladimir Putin's long-serving sports tsar, the international ice-hockey legend Viacheslav Fetisov. He told Tass that completion by 2020 was a "very ambitious timeframe", even though the cathedral will be built of glass and metal as opposed to more time-consuming and expensive stone. But he assured traditionalists that "all aspects of Russian historic design will be reflected in the interior - from Gzhel ceramics and Palekh lacquer work, to Kasli cast-iron sculpture". The Orthodox Church has long been a symbol of Russian national identity, and before the 1917 Revolution it was common for churches to be dedicated to military victories. More recently, President Putin has promoted Orthodox values as part of his campaign to boost patriotism and rehabilitate the country's imperial past.